It seems like only yesterday when the Republicans took over the U.S. Senate. Actually, nearly two years have passed since that big moment, when the GOP gained nine seats and took a 54-46 majority (including two independents who caucus with the Democrats) after eight years of Democratic control. But this may prove to be the shortest period of control for a party since the early 2000s. From the vantage point of Labor Day, it appears as though that 2014 flip could become a 2016 flop, and on Nov. 8, Democrats have a good chance to grab at least a tie (broken by the new vice president) and possibly a majority of as many as several seats. We let the Senate races settle over the summer but summer’s effectively over — and we are making eight different ratings changes this week. Many favor Democrats, but a few favor Republicans. The takeaway is that as we head into the stretch run of the campaign, the Democrats seemingly hold a narrow edge in the race for a majority. But that majority could be quite small, small enough that Republicans could be poised to wipe it out in 2018, perhaps leading to another bare minimum stint in the majority. The prevailing political conditions in a particular year, as well as the specific seats coming up, matter enormously to the Senate contests. Are they in red or blue states? Is an incumbent running and is the incumbent strong or weak? Is it a midterm year, and how popular is the incumbent president? And in presidential election years like this one, the top-of-the-ticket is critical. In recent years, as we previously documented, states have been largely voting for the same party for president and senator. Most recently in 2012, it happened in 81% of the states with a Senate race. Based on our current ratings, 28 of 34 states would see straight-ticket president-Senate voting results if everything stayed the same until November, which is 82%. The pieces of the puzzle line up well for the Democrats this year. 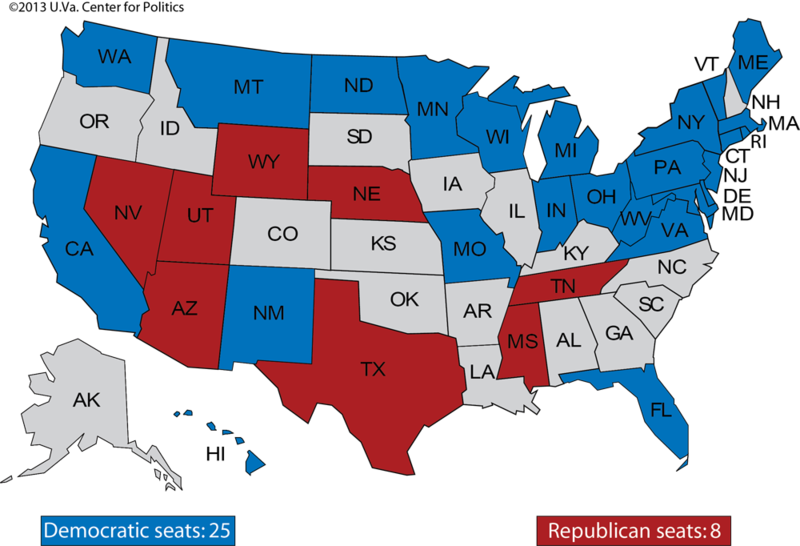 Fully 24 of the 34 Senate seats on the ballot are Republican, giving the GOP a lot of territory to defend. Only one Democratic seat is truly competitive (Nevada), and even there the Democrats have an even chance to hold it. Ten Republican Senate seats are vulnerable to one degree or another (at best rated Leans Republican), and several may already be lost. The Democratic ticket for president and vice president appears likely to win, at least at Labor Day, and adding the vice president means a 50-50 Senate, if it occurs, will be Democratic thanks to the VP’s tie-breaking vote. Finally, the Republican nominee for president is highly controversial, has divided the GOP, and made it difficult for many incumbents to tiptoe through the tulips — trying not to alienate the Trump voters while putting distance between themselves and their weak ticket leader. Put it all together, and it certainly looks like an ideal situation for a Democratic Senate takeover. The GOP leadership is fully aware of this; Senate Majority Leader Mitch McConnell (R-KY) has been calling his party’s chances “very dicey.” The GOP has one major strategic move to make in October that, if skillfully executed, might help them. That would be to go all out to protect their Senate (and House) majorities by shifting money and giving emphasis to a “don’t give Hillary a blank check” blitz on and off TV. This might offer some disillusioned Republicans and GOP-leaning independents a reason to show up at the polls. Of course, it also might infuriate Trump and his backers. Is it a stratagem that would “save” Congress or a “heads you lose, tails you lose” maneuver? As the old TV sign-off goes, only time will tell. Below, we give you our seat-by-seat analysis. 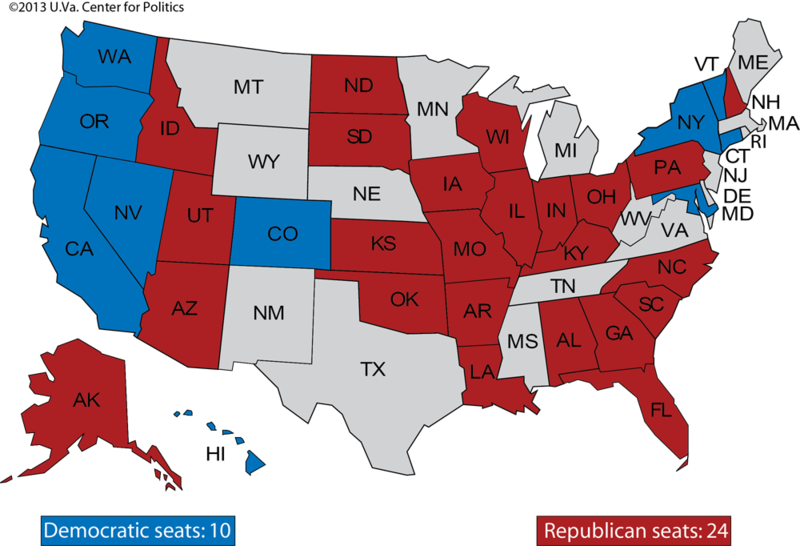 The summary is this: With more than two months to go, two GOP seats are severely endangered (Illinois and Wisconsin). Just below that duo, Democrats are now slightly favored in traditionally red Indiana while Republican incumbents in New Hampshire and Pennsylvania are struggling to overcome likely Clinton victories in their states. Republican incumbents are ahead in Arizona, Florida, Ohio, Missouri, and North Carolina, but upsets cannot be ruled out. A net gain of four to produce a tie might be the minimum Democrats can expect. A few more seats would strengthen Democrats for what will be a titanic struggle to hold on in 2018, when a low-turnout midterm will combine with a seat pattern that favors the GOP. Of the 33 seats scheduled to be on the ballot in 2018, 25 will be held by Democrats (or independents who sit in the party’s caucus). Some of the Democratic incumbents represent more conservative, rural states such as Missouri, Montana, North Dakota, and West Virginia, and others are from highly competitive swing states that can shift with the political winds. Note: The map includes the seats of Sens. Angus King (I-ME) and Bernie Sanders (I-VT) as Democratic-held because the two independents caucus with the Democrats. If we have a series of three (or even more) Senate flips every two years, it will be unprecedented in the modern era. The closest parallel would be the 1946-1954 period. In 1946, the GOP regained both houses of Congress after a decade and a half New Deal/Fair Deal dry spell, only to lose Congress in 1948 because of President Harry Truman’s surprise victory. Four years later, the Eisenhower landslide brought Republicans narrow majorities in each house, which again lasted for just two years. The GOP didn’t get back the Senate until Ronald Reagan’s sweep in 1980. From 1954 into the 1990s, Democrats never lost the House, and after six years in the Senate minority under President Reagan, Democrats regained the Senate in 1986. Finally, the Democrats lost both the Senate and the House in the anti-Bill Clinton midterm of 1994. The GOP began a long period of control, its first since the 1920s. Briefly, because of a party switch by Republican-turned-independent Sen. Jim Jeffords of Vermont, the Senate reverted to Democratic control from June 2001 to November 2002. The GOP otherwise held Congress until the anti-George W. Bush midterm of 2006. President Obama lost the Democratic House in 2010, and then the Democratic Senate in 2014. 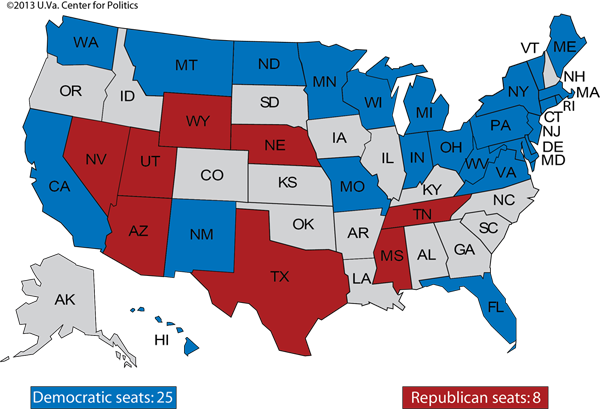 Another change in the partisan Senate majority this November will have a major impact, even if it is short-lived. Supreme Court seat(s), lower court nominations, and executive branch appointments will be affected, as will the kind and quality of negotiations with the House (assuming it stays Republican). But let’s not get too far ahead of ourselves. 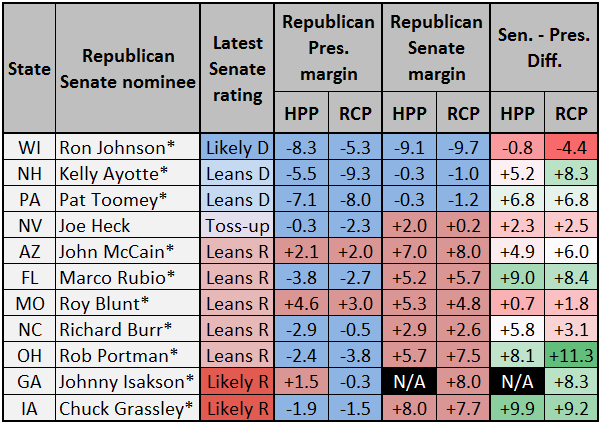 Map 3 shows our ratings for all 34 of the Senate contests up for election in November, and Table 1 directly below it lays out all of the ratings changes we’re making today. We then present our reasoning for those changes along with commentary on the other important races. The remaining weeks of the general election campaign will undoubtedly bring more ratings changes, and we will keep you updated as events dictate. Let’s tackle these in order of likeliest Democratic pickups, starting from most likely to increasingly less likely. We’ve long listed first-term Sens. Mark Kirk (R-IL) and Ron Johnson (R-WI) as underdogs in their reelection bids: Both Senate races have been leaning to the Democrats for more than a year in our ratings. Kirk and Johnson were helped by 2010’s optimal Republican conditions, but this year they drew solid challengers in Rep. Tammy Duckworth (D, IL-8) and ex-Sen. Russ Feingold (D), respectively. Feingold has never trailed in a public poll of this race, and even Republican internals show him leading: A pro-Johnson Super PAC recently released a poll by McLaughlin and Associates, a pollster that excels at producing pro-Republican numbers, that still shows Feingold leading by three points. And the public, nonpartisan polls have generally been better for Feingold. Illinois has had very little polling, but Republican outside groups appear to have abandoned Kirk, a sure sign that they do not see much of a path to victory for him. Additionally, Trump does not appear to be targeting either state. Of course, Illinois going Democratic for president is a foregone conclusion unless a Republican is winning a huge national victory. Illinois has voted at least five points more Democratic than the nation as a whole in each of the last six presidential elections. Wisconsin, though, typically votes much closer to the national average, albeit with a Democratic lean that very narrowly prevented George W. Bush from carrying the state in 2000 and 2004. But Trump appears to be deeply unpopular, including among much of the Wisconsin GOP leadership, and Trump’s ad buys thus far have not included the state. While Johnson has largely if occasionally tepidly embraced Trump, Kirk says he won’t vote for him. They are utilizing different strategies, but neither method seems likely to create the distance they’ll need from Trump to win reelection. (In fact, Johnson is currently running slightly behind Trump, as shown in Table 1 below). If Johnson or Kirk recover, it will likely be a sign that the national winds have shifted in favor of Trump and the Republicans. As of now, it’s hard to see how either one wins, so we’re moving both races from Leans Democratic to Likely Democratic. The next tier of Democratic pickup opportunities includes the open seat in Indiana, where ex-Sen. Evan Bayh’s (D) decision to run for his old seat turned a likely Republican hold into a good chance for a Democratic addition, and New Hampshire and Pennsylvania, where Sens. Kelly Ayotte (R) and Pat Toomey (R) appear to be in uphill climbs thanks to Trump. Let’s tackle the Hoosier State first. With Gov. Mike Pence on his ticket, Trump should be able to hold its Electoral College votes, but Bayh has a golden political name and a huge war chest that he preserved after his surprising decision not to seek reelection in 2010. That year, another ex-senator, Dan Coats (R), easily captured the seat, but now Coats is retiring. Thanks in part to name ID and a past reputation as a moderate Democrat, Bayh is very clearly leading right now. Still, Republicans have reason to believe, with the right attacks and a lot of money, that Bayh’s soft lead could evaporate down the stretch. Rep. Todd Young (R, IN-9), a GOP establishment favorite, is a credible opponent, and Bayh has shown some rust. After leaving the Senate, Bayh worked for legal powerhouse McGuireWoods and also for the U.S. Chamber of Commerce (which is backing Young in this race, and Republicans almost everywhere), and he has fumbled several questions from reporters about his residency. Bayh maintained a relatively inexpensive condo in Indianapolis but it appears as though he spent most of his time in Washington over the past half-dozen years. Bayh almost certainly will have to out-run Clinton on the ballot in order to win Indiana. He is well-positioned to do that, although Young and the Republicans have more than a fighting chance to stop him. If Bayh wins, Indiana will have two Democratic senators — an oddity for a state that is usually reliably Republican at the presidential level (even though it very narrowly backed Obama in 2008 in what appears to be something of a fluke). Interestingly, the last time Indiana had two Democrats in the Senate, Evan’s father, Birch Bayh, was one of them. With fellow Democrat Vance Hartke, Bayh and Hartke served together from 1963 to 1977. While Ayotte and Toomey are impressive candidates, Clinton appears to have decent-sized leads in both New Hampshire and Pennsylvania, and several polls have shown their respective opponents, Gov. Maggie Hassan (D) and former gubernatorial chief of staff Katie McGinty (D), taking leads (polling averages are basically tied or show a small edge for the Democrats). So Ayotte and Toomey are running ahead of Trump, who is generally doing poorly in both states, but not by enough to win. We’ve long thought that the GOP presidential nominee needed to perform better than Mitt Romney did in both of these states in order for the Senate incumbents to prevail. Romney lost both states by about 5.5 points in 2012, and right now Trump is losing each by high single-digits. That is not to say the challengers in these states are perfect. Hassan recently got crossed up by a question about Hillary Clinton’s trustworthiness, and observers consider McGinty weak on the stump and a poor public speaker. But by far the most important factor in these races is Trump: He needs to start doing better in both places or he’s going to drag down Ayotte and Toomey. We’re moving all three of Indiana, New Hampshire, and Pennsylvania from Toss-up to Leans Democratic. There’s a clear chance for Republicans to recover in each of these places, but we just think it’s wrong to look at any of these states as true Toss-ups right now. 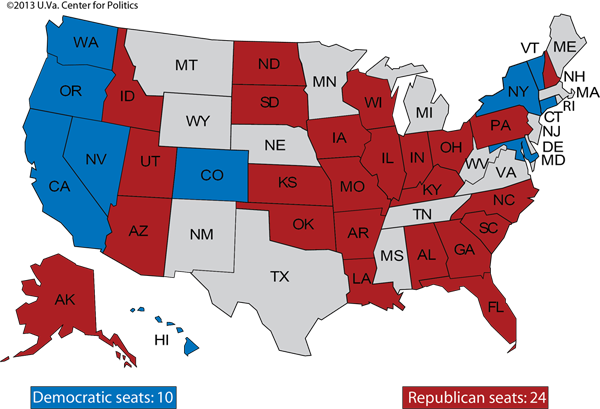 If these ratings hold, Democrats would win five Republican-held Senate seats: Illinois, Indiana, New Hampshire, Pennsylvania, and Wisconsin. That would put them at 51 seats, and a clear majority — but they also need to hold Nevada, the only remaining pure Toss-up on our map. There, Rep. Joe Heck (R, NV-3) and former state Attorney General Catherine Cortez Masto (D) are basically tied, and Clinton only appears to be very narrowly leading Trump. That probably has to do with the fact that Nevada, despite being a diversifying state, has lower average educational levels than many of the other presidential swing states. Trump has the potential to out-perform the typical Republican among non-college educated whites (but potentially do worse among college-educated whites and nonwhites overall). In any event, Nevada remains a challenging hold for Democrats. But even if Democrats lose Nevada, they’d still get to 50 Senate seats (and have a Democratic vice president breaking the tie to install a Democratic majority leader) if the current ratings hold. The news here is not all bad for Republicans. Moving into the Leans Republican category, from Toss-up, are Sens. Rob Portman (R-OH) and Marco Rubio (R-FL). Recent polling has shown them very clearly running ahead of Trump in both the Buckeye and Sunshine states, and Trump isn’t doing as poorly in those states — both of which vote slightly more Republican than the nation as a whole in presidential races — as he is in places like New Hampshire, Pennsylvania, and Wisconsin. We knew going into this election that Portman would have a lot of ammo to use against former Gov. Ted Strickland (D). Fairly or unfairly, Strickland gets blamed for the economic problems that happened during his term in office (2007-2011, which coincided with the economic collapse of 2008). Beyond that, though, Strickland’s governorship is not particularly well-remembered, and whatever lingering good will voters had toward Strickland was obliterated by Portman’s ad blitz: Ohio has seen the most Senate ads this cycle so far, and more than 60% of those ads have been sponsored by Portman or his allies. Portman has a ton of money and he and his allies have been using it effectively to both attack Strickland and boost Portman. It also does not seem as though Strickland has been running an especially energetic campaign, and he just doesn’t have the resources to go toe to toe with Portman. And, as Table 1 shows, Portman’s margin versus Strickland is eight to 11 points better than Trump’s margin versus Clinton in the polling averages, one of the best marks of any Republican Senate nominee in 2016. We remain skeptical that Portman could finish that far ahead of Trump in an era where voters don’t split their tickets as much as they used to do. Yet Trump is also a very unusual candidate and Portman, who did not come into this campaign with a major statewide profile, is running a strong race organizationally and financially. Still, if Trump ends up losing Ohio by five points or more this race could tighten up again even though Strickland is weak. Portman clearly seems like he’s back in the driver’s seat, and Democratic outside groups appear poised to abandon Strickland, if they haven’t abandoned him already. The signs in this race are all pointing toward Portman. Notes: *Incumbent. HPP refers to HuffPost Pollster, RCP to RealClearPolitics. Data are as of Wednesday afternoon (Aug. 31, 2016). 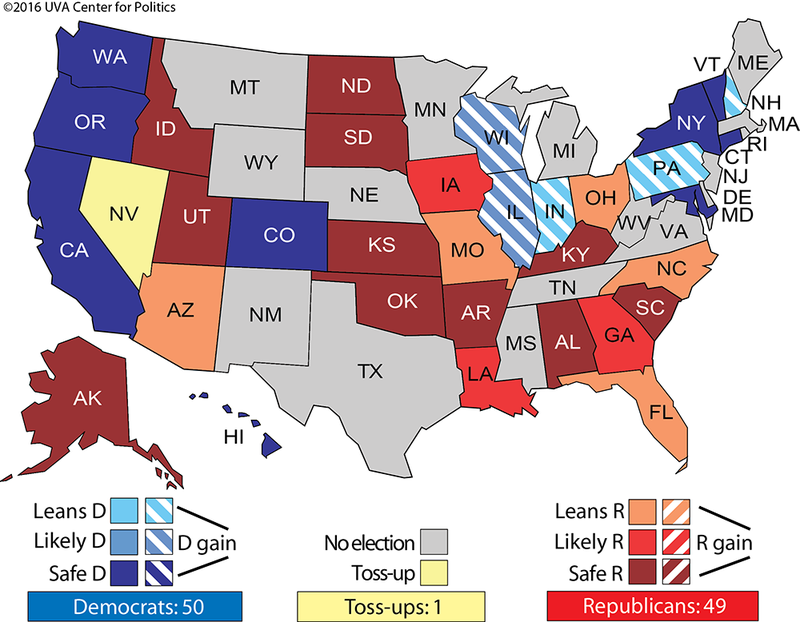 States that are included have Senate races that the Crystal Ball currently rates as Toss-up, Leans, or Likely for one party. Because of limited data, neither major average has Senate polling averages for Illinois, Indiana, and Louisiana. The only polls in Indiana indicate that Todd Young (R-IN) is running behind Trump in Indiana, to the benefit of Evan Bayh (D-IN), who is running ahead of Clinton. Rubio isn’t in quite as commanding a position as Portman. For one thing, his opponent, Rep. Patrick Murphy (D, FL-18), has shown greater fundraising strength than Strickland, and even though Murphy has faced questions about an inflated resume, he doesn’t have the weight of baggage that Strickland does. Rubio is faring better than Trump and has a roughly five-point polling edge over Murphy. A group of voters that could be pivotal are Cuban Americans, particularly in South Florida, Rubio’s home turf. The group as a whole is more Republican-leaning than other Hispanic subgroups — though younger Cuban Americans are much more Democratic — but Trump’s struggles among Hispanics are so far not trickling down to damage Rubio to the same extent. Take two August polls: Monmouth University found Clinton up 69%-19% among nonwhite voters, but Murphy only ahead 58%-34%. And an earlier Quinnipiac poll showed Clinton up 68%-21% among nonwhites, but Murphy up 57%-37%. According to the 2012 exit poll, Latinos made up a larger share of the Florida vote than African Americans, and knowing that black voters are firmly in the Democratic camp, it’s likely Latino voters account for much of this difference in Democratic performance between Clinton and Murphy. Florida and Ohio join the Leans Republican category, which also includes Arizona, Missouri, and North Carolina. These are all potential Democratic opportunities, particularly if Trump slides further. On the other hand, Trump could conceivably win all these states if he improves his presidential standing, which would help the incumbents. Of these five states, it’s possible that Sen. Richard Burr (R-NC) is in the most beleaguered position. His unheralded challenger, former state Rep. Deborah Ross (D), has crept up in the polls, and Burr only has a narrow lead. Republicans are frustrated with Burr because they do not believe he has taken this race as seriously as he needs to do. But Burr is easy to underrate as a politician, and he’s won two races fairly comfortably in 2004 and 2010. Both contests seemed more competitive than they turned out to be. Again, just as with other races discussed here, if Burr loses Trump will be a large part of the explanation. Finally, we’re flagging one additional race as a long shot possibility. The presidential contest appears to be close in Georgia, a state that is changing in ways that are favorable to Democrats (although it is most definitely still more Republican than the nation as a whole). We believe Trump retains an edge in Georgia, and Sen. Johnny Isakson (R-GA) should run ahead of Trump. However, Isakson is not doing dramatically better than Trump in polls: In the RealClearPolitics average, Isakson is up eight points on his opponent, businessman Jim Barksdale (D), and is at an average of 45% in support, while Trump is at 43% and tied with Clinton there. That’s not as much crossover support as one might expect for a long-time, well-liked incumbent, so Isakson could theoretically be vulnerable if Clinton ends up winning Georgia. Isakson’s position is similar to that of Sen. Chuck Grassley (R-IA), who also should be fine in the end, but is a little more vulnerable than usual because of the presidential race. We’re moving Georgia from Safe Republican to Likely Republican, mostly just out of an abundance of caution. Isakson is still the clear favorite. Counting seats not on the ballot this fall, our current ratings show 50 seats Safe, Likely, or Leaning Democratic, 49 Safe/Likely/Leaning Republican, and a lone Toss-up, Nevada. As longtime readers know, we push ourselves to establish a favorite in as many contests as possible so that our maps aren’t covered with Toss-ups. The risk in taking this approach is that close races can wobble back and forth in the final weeks, so don’t be surprised if and when some states change color before the election! With this cautionary warning, it appears to us that Democrats have a slightly easier path to the Senate majority than the Republicans. At the same time, let’s reemphasize that, given the looming 2018 map, Democrats are going to have to do better than a tie or a tiny, 51-seat advantage in order to have a decent chance to retain any majority they might win this cycle.